This had led to Alexander falling in love with Roxane (Roshanak). She was a prisoner of war at the young age of sixteen and Arrian wrote “Alexander fell in love with her at sight; but, captive though she was, he refused, for all his passion, to force her to his will, and condescended to marry her.” Ultimately, Roxane was Alexander’s first official wife even though he had a child with Barsine. 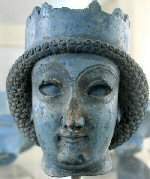 With falling in love with Roxane, Alexander fell in love with Persian culture. The most prestigious interesting thing that the Persians did that the members of Alexander’s court from Macedonia loathed was “Proskynesis.” “When the Persians meet one another in the roads, you can see whether those who meet are of equal rank. For instead of greeting by words, they kiss each other on the mouth; but if one of them is inferior to the other, they kiss one another on the cheeks, and if one is of much less noble rank than the other, he falls down before him and worships him.” [Herodotus, Histories 1.134] Alexander started to use proskynesis and his followers did not believe that he was losing his heritage, as pride was a huge issue for the Macedonians. However, Alexander believed that to rule over the Persians, he had to change himself and his people and have a good medium. He thus forced many of his soliders to marry Persian woman after he had concurred another part of the Persian empire. Brosius, Maria. The Persians: An introduction. New York: Routledge, 2006. Print. Huh, I had no idea that he forced his men to marry Persian women to fit into the culture! Very interesting. I imagine they were not very happy about having to comply with some of that stuff.